These drinking fountains use freeze-resistant valve assembly to provide year round operation. Fully engineered pneumatic valve assembly is one of the best in freeze-resistant technologies. The column like design allows the square pedestal to be placed securely in multiple locations without taking up excess space. Equipped with vandal resistant components, these fountains are not easily disrupted, quickly discouraging the worst of vandals. These highly durable drinking fountains feature concrete construction with an exposed aggregate finish and wire to reinforce the vibra-cast. The anti-squirt bubbler head is polished chrome-plated forged brass with an integral basin shank that is shielded and vandal-resistant. The polished chrome-plated push-button requires less than 5 lbs. to activate, and the waste strainer allows for top down access to waste lines for easy maintenance. Options include a Freeze-Guard valve for areas with high water tables, and custom concrete color and finish options are shown below. Model 6518FR is a fully engineered system with pneumatic operated freeze resistant bury valve installed below frost line, with check valve to drain water from unit when not in use and to prevent back-flow cross contamination. Now Requires the 3121FR, 3121FR-CC, 3121FR-CF or 3121FR-CCF and one of Valve Systems (Model 6518FR) Listed Below (Sold Separately) for a Complete Unit. Model 3121FR - Square Pedestal (Freeze Resistant) Drinking Fountain. 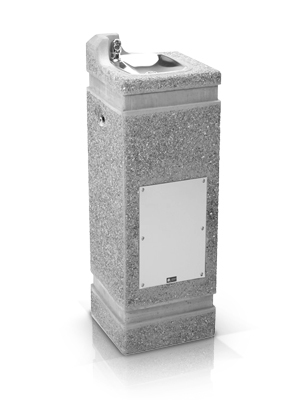 Model 3121FR-CC - Custom Cement Color Square Pedestal (Freeze Resistant) Drinking Fountain. Model 3121FR-CF - Custom Finish Square Pedestal (Freeze Resistant) Drinking Fountain. Model 3121FR-CCF - Custom Color & Finish Square Pedestal (Freeze Resistant) Drinking Fountain. Model 6518FR - Valve System (Freeze Resistant) fully engineered pneumatic operated valve Applicable for 2 Bubblers.